Hexawise allows you to adjust testing coverage to focus more thorough coverage on selected, high-priority areas. 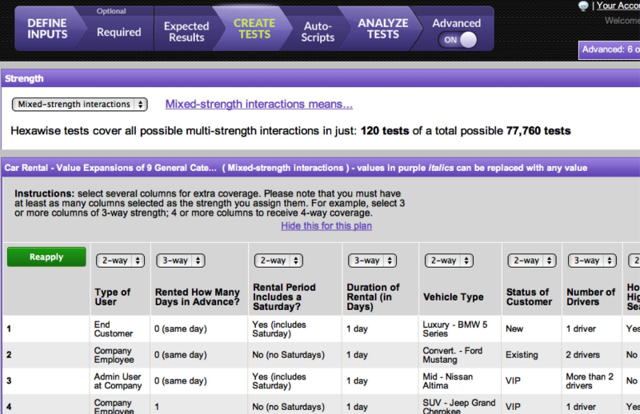 Mixed strength test plans allow you to select different levels of coverage for different parameters. Increasing from pairwise to "trips" (3 way) coverage increases the test plan so that bugs that are the results of 3 parameters interacting can be found. That is a good thing. But the tradeoff is that it requires more tests to catch the interactions. The mixed-strength option that Hexawise provides allow you to do is select a higher coverage level for some parameters in your test plan. That lets you control the balance between increased test thoroughness with the workload created by additional tests. See our help section for more details on how to create a risk-based testing plan that focuses more coverage on higher priority areas. As that example shows, Hexawise allows you to focus additional thoroughness on the 3 highest priority parameters with just 120 tests while also providing full pairwise coverage on all factors. Mixed strength test plans are a great tool to provide extra benefit to your test plans.